Smythesdale is a rural village on the Glenelg Highway, 18 km south-west of Ballarat. It was named after John Smythe, who took up a pastoral lease in the area in 1849. His name and the name of his property, Nentinball, are found closer to Ballarat, at Smythes Creek. (The creek also passes through Smythesdale). Gold was discovered at Smythesdale in 1853, and shortly afterward southwards along Smythes Creek toward Cape Clear. An Anglican school was opened in 1856. By 1861 a township was sufficiently developed for a court house to be opened and a borough council to be created (12 April). Smythesdale had its largest population during the 1860s, when there were a mechanics’ institute, free library, a foundry, a sawmill, a brewery and numerous hotels. Residents laid out a public park, a racecourse, formed several sporting clubs and an amateur theatrical club. 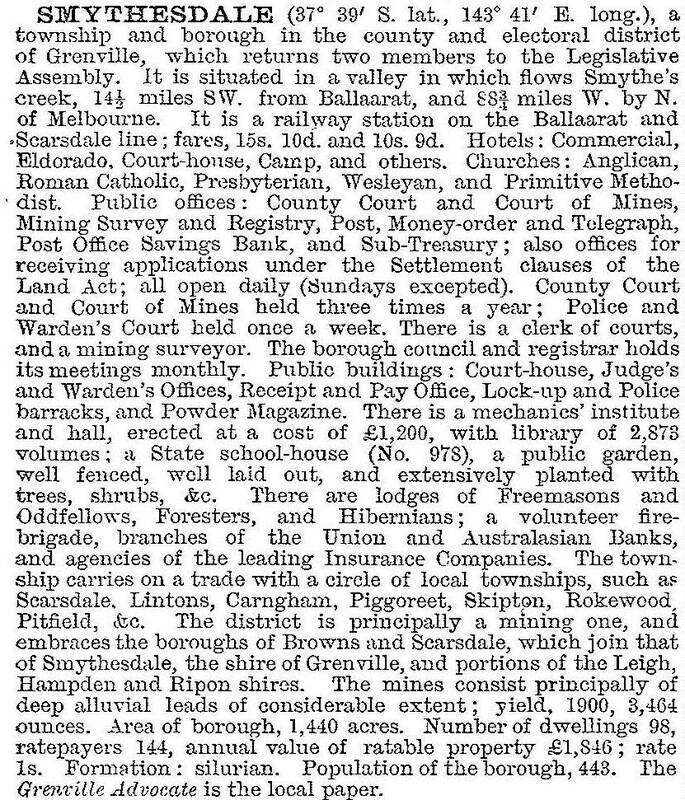 In 1883 Smythesdale was connected by railway to Ballarat. On 1 October 1915, Smythesdale borough and the adjoining Browns and Scarsdale borough were united with Grenville shire. Smythesdale is adjoined by farmland and further to the east and west by State Forest. The Yellowglen Vineyard, a maker of sparkling wines, is established on the former Yellow Glen mine site. In 2004 the Foster's Group announced the closure of the Yellowglen wine processing and packaging plant at Smythesdale. In the village there are a few shops, a hotel, two halls, a Catholic church, a recreation reserve and a primary school which is the Smythesdale campus of the Woady Yaloak school. The former court house which is on the Victorian Heritage Register is used by the Woady Yaloak historical society, and the former post and telegraph office is a private residence. The railway line (1883-1983) is a recreational rail trail.